Penny Lane's parents are obsessed with the Beatles, in case you couldn't tell by her name. Penny has been burned by love for the last time, when her summer crush cheats on her. 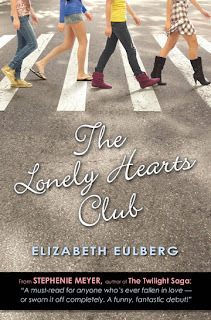 Penny decides what she needs is to declare herself the sole member of her own Lonely Hearts Club. Penny will not date any boys for the remainder of her high school career. Some other students end up being mistreated by guys too and decide they want to join up. Soon enough there are over 40 girls meeting at Penny's house and cementing their females relationships. The school principal and many of the high school boys aren't too keen on the club. Penny holds her ground, these girls really need a support system and they all want to stick together. The club starts to become more about friendship and improving yourself and grades instead of an actual Lonely Hearts Club. This novel was completely fab. I could not stop laughing out loud throughout it. Penny Lane is a fantastic character and a great leader to the girls. She is just such a real person, shy about taking control, but does what needs to be done. I would have loved something like this when I was in high school, a huge support system of friends who have your back no matter what. It was nice to see all these girls for-going cliques and class years to band together to better themselves. Penny had mentioned at one point that they should all study together, since the older girls had already had a lot of the classes the younger ones were taking and therefore could help them out. Now, this book was definitely not all about grades and bettering oneself. There was plenty of boy drama. I could see why Penny would have to give up boys, they were all up in her stuff this whole book. All the characters were really great, even though Penny was really the primary focus of the book. Her two best friends made a good team and evened each other out. Really though this book was just a great, funny read about a club that ends up being more than it was supposed to be. This is up there in funny-ness with the Georgia Nicolson series, so seriously check this book out! "When I was five years old, I walked down the aisle with the man of my dreams." "'Right! I remember that you had to be John and I was Paul and we had stuffed animals be Ringo and George.'" I've had this book on my to buy list for ages and I keep forgetting to get it! thanks for the reminder.